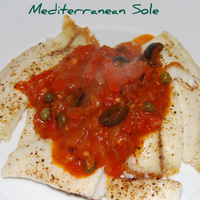 This sole recipe cannot be beaten for flavor and looks absolutely stunning. The fillets are grilled and served with a light, healthy and delicious tomato sauce that has all the taste of the Mediterranean. It is a really quick and easy dish that you will want to make again and again. We usually serve it with our baked potato recipe and a fresh green vegetable or a crisp dressed salad. 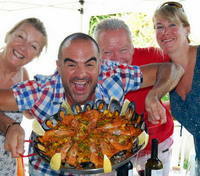 Why not include this in your own Mediterranean Diet it's healthy and full of goodness. This recipe can really be used for any fish fillets.....we've made it with hake, snapper, tilapia, any good fresh fish fillet is fine. Wash the fish fillets under the tap and dry off with kitchen paper. Put to one side until you have cooked the sauce. Fry the onion in the olive oil over medium heat until softened and then turn down the heat and add the garlic. Cook for 3-4 minutes stirring well. Add the fresh tomatoes - or open the can and pour in the juice, then roughly chop the tomatoes in the tin with a sharp knife, and pour into the pan. Add all of the other ingredients except for the basil, capers and olives. Allow to simmer for about 20 minutes, stirring occasionally. Remove the bay leaf and discard, add the basil. Blend the tomato sauce with a stick blender, or any type of food processor until not quite smooth. It's better for the sauce to retain some texture. Add the olives and capers and put to one side. Place enough well greased foil on to your grill pan to accommodate the fish fillets. Arrange the fillets evenly on the foil, season with salt and ground black pepper. Drizzle a little olive oil over them. Place under a pre heated hot grill for about 5 minutes....depending on the thickness. Rule of thumb is 10 minutes per inch of thickness. Insert a cocktail stick into the centre of the thickest fillet. 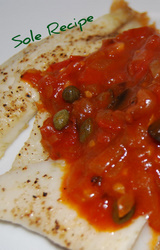 If there is no resistance the fish is cooked....if not, cook for a little longer and test again. Re heat the sauce gently, bring it to just under the boil. Arrange the fillets evenly between 4 warm plates. Top with the sauce and serve immediately. Yummy!! This also goes really well with our brown rice recipe.